Clematis viticella 'Little Nell' is a non-evergreen climber with single, semi-nodding, pale creamy-white flowers with distinctive mauvish-pink margins, veins and greenish-yellow centres from July to September. 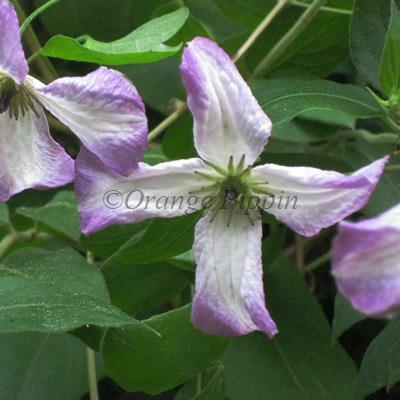 Clematis viticella 'Little Nell' was obtained from Francisque Morel of Lyon by William Robinson in 1915 and named after the wife of Ernest Markham, Robinson's head gardener. This pretty climber would look lovely grown through small to medium-sized trees and large shrubs or grown up a trellis, garden fence or wall.